I write two other blogs related to dollmaking. One is called MAIDA Today - MAIDA stands for "making antique inspired dolls and accessories". On that site there are interviews with doll makers and pattern designers. There are also many antique dolls featured. There is also a doll maker's group focused called the MAIDA Dolls Group. Click the images below to go to the sites. 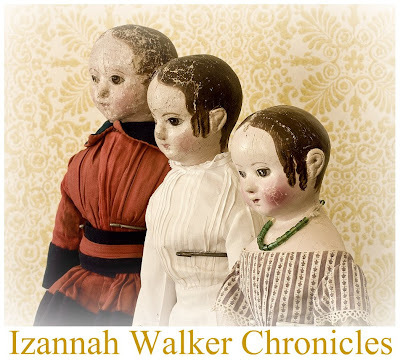 The other blog I write is focused on historical examples of Izannah Walker Dolls and is called The Izannah Walker Chronicles. I started it in 2008 because I was excited to share pictures I had been able to take of an original antique Izannah. And the site developed over the years to become the site I wish had existed when I first started studying Izannah's dolls. Studying Izannah's dolls has been a gift to me over these last 6 years. I'm not done with them, although I am focusing on a couple of other antique folk art types right now. But I will always return to Izannah. :-) The banners below take you to these other sites.